Looking for USB Duplicator Software for Mac? USB Duplicator Now is easy to use software that helps you rapidly copy files to many USB memory sticks. You need a Windows or Mac computer, any USB hubs you have available, and all the USB flash drives you need! Buy below for Windows, or get the USB Duplicator Software for Mac. Why buy expensive specialized hardware, sometimes for more than €1000? USB duplicator software can be much cheaper. You get a flexible solution at a fraction of the cost! Your program is fabulous. Easy to use and super-fast. Just the solution I needed to copy 300 flash drives for a conference. -Arnold T.
How does the USB Duplicator Now work? The USB Duplicator Now is software that turns your computer into a USB drive duplicator. It is a simple to use, point-and-click program. Just run the program, and it autodetects all USB drives connected to your computer, and shows them all. 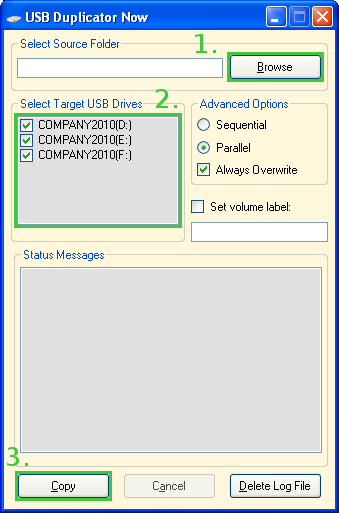 Select the source folder, and in a short time, all the selected USB drives will have the same contents. And you're done! An activity window shows you exactly what is going on at all times. You'll be notified when the copying is done. Select source folder, verify preselected drives, and go! What is a USB duplicator? A USB duplicator is a machine that assist in replicating content to many USB flash drives. USB duplication is usually a service provided that does the work for you. What is USB Duplicator Now? USB Duplicator Now is software that turns your computer into a USB duplicator. USB Duplicator Now is specifically designed to simplify the task of quickly copying content to lots of USB drives. It takes advantage of additional USB hubs connected to your computer to write to more drives in parallel. Do your own USB duplication with USB Duplicator Now. Is cheap USB duplicator software inferior to expensive hardware? No. Getting software is usually much cheaper than buying specialized hardware. With USB Duplicator Now, you can use standard hardware, off-the-shelf, easy to acquire and replace. And even with no equipment, you can get started the same day. Upgrading and extending software is also easy. How many USB sticks can I copy files to at the same time? This depends on your computer. You can use all the ports on your computer, and even add al USB hubs to each port, and then use all the USB ports on all those USB hubs. If you use three 7-port USB hubs, most computers will easily handle 21 parallel copy jobs. How do I disable autorun on my system? It's a problem when connecting all those USB drives! We have written instructions for various operating systems: Disable AutoRun. Which copy method is better - Parallel or Sequential? Parallel tends to be a lot faster. For example, parallel copying can finish writing to 10 USB memory sticks in about the same time as it would take to copy to one USB memory stick, because they are all working at the same time. What else can I do to speed up duplication? Use powered USB hubs, connect your laptop to the mains power, and get the fastest USB memory sticks you can. There can be a large speed difference between fast and cheap memory sticks. Does USB Duplicator Now support USB drive cloning? We have written a separate page showing how to clone a USB drive with USB Duplicator Now. Can I add or update files on many drives with USB Duplicator Now? Yes. We have written a separate page showing how to add or update files with USB Duplicator Now. I get an error: "Access to the registry key '...' is denied." What should I do? This is a problem for some users of Windows Vista and Windows 7, which we are fixing in the upcoming release, but there is an immediate workaround. When starting the USB Duplicator Now, right-click on it and choose to run it with Administrative privileges, instead of starting it by clicking on it the normal way. This should solve the problem with the current version. Have any other questions? Please do not hesitate to get in touch with Customer service! A USB 2.0 port can handle transfer speeds of up to 480Mbit/s. This is far faster than the memory on most memory sticks. For this reason, writing in parallel to many sticks can be much faster than writing sequentially to one stick at a time. And the new USB 3.0 standard will allow for speeds up to 4.8Gbit/s - ten times faster! UB Duplicator Now should work flawlessly on new hardware. The USB Duplicator Now takes advantage of these high speeds by writing in parallel to many drives at the same time. Your copy tasks will be completed much faster than sequential batch scripts or manual copy jobs. By speed alone, the USB Duplicator Now will usually save you the software cost in labour hours. So what are you waiting for? We even have a 30 day money back guarantee! ...and lots of other uses that involve handing out memory sticks with files.